The total number of views of South African open access research via SciELO SA totals almost 15 million to date (December 2018). The SciELO SA User Group met again on 21 November 2018 at the Southern Sun Hotel, OR Tambo. The topic was the introduction of the new SciELO Network criteria. Fifty-five people attended the meeting. The meeting consisted of both an informative and practical session. The feedback received from the attendees will be incorporated into the new criteria guidelines and timeline for SciELO SA journals. At the end of November 2018, the bi-annual assessment of the SciELO SA platform took place. The collection was awarded a score of 98,8%. ASSAf hosted a stimulating full-day meeting of 62 members of the National Scholarly Editors’ Forum (NSEF) on 20 November 2018 at the Southern Sun Hotel OR Tambo, Johannesburg. Although the forum usually meets annually, the event was not held in 2017 due to budgetary constraints. Feedback on three of the recently completed Peer Review Panel reports was given. The panels recommended that journals in these disciplinary groups, Communication and Information Sciences; Humanities II: Visual and Performing Arts; and Architecture, Built Environment and Engineering, improve their governance and management structures, broaden editorial boards, widen diversity and representation from authorship to readership, encourage authors from outside the country (especially from other African countries), encourage young researchers to publish, and move to open access. Prof David Walwyn of the School of Technology Management, University of Pretoria gave feedback on the Incentives for Collaborative Research Project, which ASSAf initiated, and shared the recommendations and conclusions from the study. Collaboration enhances research and publishing, although measurement is a challenge. 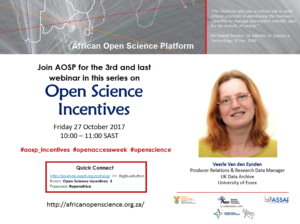 Ms Elizabeth Marincola, Senior Advisor of Communications and Advocacy in the African Academy of Sciences (AAS), presented on the AAS Open Research and the advancement of open scholarship. Prof Robin Crewe, Chairman of the Committee on Scholarly Publishing in South Africa (CSPiSA), gave a presentation on the twists and turns of authorship with an emphasis on conflicts of interest and misconduct. The DHET requested ASSAf’s assistance in constituting a Peer Review Panel to evaluate the new and re-applications of journals for DHET accreditation. A panel of 14 expert scholars were selected from ASSAf Membership, SAYAS and the National Research Foundation (NRF) databases. There were 23 journals under review from various fields of humanities, social sciences, education, health and law. A meeting of the panellists to review the journals took place on 5 November 2018 in Johannesburg. Reports from the meeting were sent to the DHET in early December. • 2018 Global Research Council (GRC) Africa Regional Consultative Meeting (8 November 2018, Abidjan, Côte d’Ivoire). The meeting was co-hosted by PASRES (Côte d’Ivoire) and the NRF (SA). 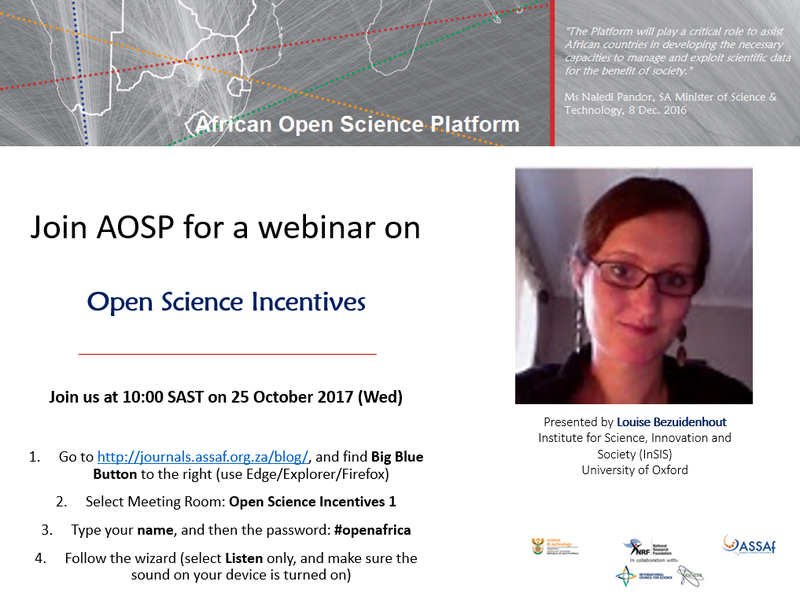 • AOSP sponsored a session during the past Annual Meeting of African Science Academies (AMASA). The session took place on 14 November 2018 in Benin. • Association for Information Science and Technology (ASIS&T) Meeting Skype Presentation (8 November 2018, Vancouver, Canada). A working group under Prof Benjamin Aribisala, assisted by Dr Ousmane Moussa Tessa who also attended the AOSP Information and Communication Technology (ICT) Infrastructure meeting on 14 May 2018, has been established to explore existing work done thus far, and to propose a roadmap towards implementation by governments. All other (Incentives, Capacity Building and Open Science Policies) frameworks were presented and tested during the past AOSP Technical Advisory Board Meeting on 3-4 November 2018, Gaborone, Botswana and International Data Week (IDW) Conference 2018. During the past, Libsense Repository Workshop the UbuntuNet Alliance managed to create a platform for librarians (specifically institutional literature repository managers) to engage with technical NREN staff, to investigate support and collaboration. A parallel meeting with vice-chancellors from universities across Africa was hosted by UbuntuNet to discuss ways in which universities and NRENs can strengthen collaboration towards addressing the challenges brought about by the Fourth Industrial Revolution. AOSP funded three facilitators from Ethiopia to participate in the Foundational School in Data Science from 22 October to 2 November 2018 at the University of Rwanda. This school was co-hosted by the University of Rwanda, Research Data Alliance (RDA) and CODATA. International Data Week 2018 brought together more than 800 participants from 64 countries and six continents, with top numbers from Botswana, South Africa and the United States. The AOSP was part of the organising committee, and also managed to fully/partially sponsor 30 delegates from Africa. The host was the University of Botswana, and the main organisers were CODATA, RDA, World Data System (WDS), ASSAf and the University of Botswana. From the outset, IDW2018 was aligned with the mandate of AOSP – which is to create awareness and advocate for high-quality research data to be curated in a fair way. The proposed draft International Data Week Gaborone Statement, one of the outcomes of the conference, is being finalised. During SFSA 2018, AOSP Hosted A Session Titled “Relevance of Open Data towards a Sustainable Environment, focusing on data in priority disciplines. The session was well attended, and the panel comprised of three speakers from different African countries and fields.The future AOSP will be launched during the upcoming SFSA. During the SFSA closing session, it was indicated that AOSP’s pilot phase (2016-2019) will be followed by a phase two of the project. The AOSP launch document was shared with the audience at the forum and made available online. • Science Communication Conference in Stellenbosch from 2-9 November. • Science Centres Conference in Thohoyandou on the 26-30 November. • Assisted with organising the lecture by Professor Stephan Borrmann from the Institute for Atmospheric Physics at the Johannes-Gutenberg-University in Germany who was a visiting scholar at Wits University. • On 15 September Quest visited the ScopeX event and distributed copies. Quest was distributed at the SFSA 2018 held between 10-14 December 2018. Article-level metrics, specifically Views and Downloads, were activated for the five journals on the ASSAf OJS Journals platform in November 2018. Planning is underway to include Dimensions for all articles on the platform. Dimensions is a digital tool that gathers citation data from various platforms, indexers and harvesters and displays the data as one citation count on the article landing page. The usage of the articles in the platform attests to the value the platform offers. Since its inception in 2009 the total number of views of South African open access research via SciELO SA has been more than 12.6 million. When comparing the 1st quarter of 2018 with the 1st quarter of 2017 there has been a 76% increase in the number of page views of South African articles via SciELO SA. All SciELO SA journals assign digital object identifiers (DOIs) to articles to provide a persistent link to their location on the Internet. Most of the journals have been included in the Directory of Open Access Journals (DOAJ). Those that are not, are in the process of applying. The Report on Grouped Peer Review of Scholarly Journals in Visual and Performing Arts was approved by the ASSAf Standing Committee on Scholarly Publishing in South Africa (CSPiSA) and Council and is currently in production. The version 2 draft reports of the journals being evaluated in the Communications and Information Science discipline groupings were sent to the journal editors for comment and the reports are being revised with updated information. Reviews in the following three subject groups are currently being conducted: Education (17 journals); History, Philosophy and Politics (25 journals); and Maths and Science (22 journals). All three panels have recommended names of potential reviewers. After being cleared for conflict of interest, three reviewers for each journal are appointed. Reviews of the journals are underway. The annual NSEF meeting is in planning and consideration is being given to having the official launch of the ASSAf Report: Twelve Years Later: Second ASSAf Report on Research Publishing in and from South Africa (2018) at this meeting with invitations being extended to other important stakeholders and not just journal editors. The NSEF Code of Best Practice was revised and then approved by the CSPiSA and Council. The new Code of Best Practice in Scholarly Journal Publishing, Editing and Peer Review will be made available to journal editors and will be officially launched at the annual meeting. The Committee gave their feedback and approval of the Report on Grouped Peer Review of Scholarly Journals in Visual and Performing Arts and the revised NSEF Code of Best Practice. The Committee met on 10 April 2018 to discuss the activities of the Scholarly Publishing Programme. The relevant sustainable development goals (SDGs) descriptors will soon be added to each of the publications on the repository. This is useful as the keywords will be picked up by harvesters, and can be used to group together publications on a specific SDG. Other investigations that are underway is the inclusion of altmetric and dimension data badges to the repository (which will provide article level metrics), and adding machine readable CC-licenses to individual publications. The development of the four frameworks to guide African countries to implement open science policy, make provision for an ICT and research infrastructure in support of data sharing and other activities in the data lifecycle, training all relevant people involved in the creation and management of research data (IT, researchers, librarians, research officials, funders, and more), as well as ways to incentivise researchers for sharing data, are receiving priority. A second phase for the platform will be announced during the upcoming SFSA meeting in December 2018. The project team has provided major input into the documentation for the proposed framework, as well a 2nd strategic meeting to be held during September 2018. The 11th Research Data Alliance (RDA) Plenary brought together data scientists, experts and practitioners engaged in the advancement of data-driven science and economy from across the globe. The theme of the conference was From Data to Knowledge. ASSAf – through the AOSP project – contributed to raising awareness amongst librarians during the conference, hosted by the Uganda Library and Information Association. Uganda hosted a high-level Uganda Open Data/Open Science National Dialogue and associated meetings in April 2018. AOSP was a funder of the event which was coordinated together with the African Union of Conservationists, with great support from the Uganda National Council of Science and Technology (UNCST). The meeting was well attended by more than 60 people. AOSP had the opportunity to participate in the recent IST-Africa2018 conference. The message shared during the IST-Africa2018 conference in Botswana from 9 – 11 May 2018 was that researchers and government are committed to turn research into knowledge products, implementing policies to strengthen human resource development, towards sustainability and more people becoming entrepreneurs and creating jobs. The conference had high-level support from the Botswana government. All participants during the AOSP ICT Infrastructure meeting held on 14 May 2018 in Pretoria, South Africa were in agreement that a document guiding African countries in preparing ICT infrastructures in support of research data sharing, will be of benefit to all. The one day meeting brought together key stakeholders. The DST has – in partnership with the European Union (EU) – started a dialogue on an Open Science policy framework for the country. The first of the meetings took place in December 2016, followed by a workshop from 30 November to 01 December 2017. An expert task team was assigned and compiled an interim report following input from all relevant stakeholders, to further direct the process and the drafting of a framework, supported by the DST steering committee. With the advent of the DST Science Engagement Strategy, all promotions and popularisation events are expected to align and speak to outlined objectives and aims. Each entity of the DST is expected to have at least engaged with 80% of the ‘publics’ by the end of each year and outlined the budget in line with the recommendations of the strategy. Against this background, Quest has sought to reach all publics in every event per term. Quest has partnered with event organisers to strategically plan events to reach 50 –60% of the public. Quest participated in various Science festivals and events throughout the country. The South African Journal of Science announced the launch of the Associate Editor Mentorship Programme in April 2018. The call for this one-year mentoring programme was open to early career researchers with a PhD who have a strong publication record but little or no editorial experience. The first Associate Editor mentees for the South African Journal of Science were appointed in May 2018. The successful candidates are Dr Maitumeleng Nthontho from the University of Pretoria (for Social Sciences & Education) and Prof Yali Woyessa from the Central University of Technology (for Earth & Environmental Sciences). Altmetric – a programme which provides a score or article-level metric that indicates engagement via Facebook, Twitter, social bookmarking, blogs and general news coverage – was introduced for all journals on the OJS Journals platform in May 2018. To accompany the metric, social share buttons were activated for the other five journals to allow readers to be able to share the articles via social media. The first User Group Meeting of the ASSAf OJS Journals was held on 4 – 5 June 2018 in Pretoria. The Editors and Journal Managers of the six journals on the platform comprise the User Group. The meeting included discussions on the future of the platform, a formal memorandum of agreement and business plan, as well as OJS technical training. Dr John Butler-Adam; Prof Robin Crewe (Chairperson); Prof Tania Douglas; Prof Wian Erlank; Prof Wieland Gevers; Dr Leti Kleyn; Mrs Veronica Klipp; Prof Andries van Aarde. ASSAf secretariat: Linda Fick; Mmaphuthi Mashiachidi; Tsepo Majake; Ina Smith; Desré Stead; Louise van Heerden; Susan Veldsman. The Scholarly Publishing Unit held the books and conference proceedings evaluations in 2014 and 2015. The DHET notified ASSAf in writing that they did not have funds for 2016 and beyond and that they would be conducting the evaluations themselves. Other programmes within ASSAf managed to generate some funds in terms of contract research and that allowed ASSAf to reprioritise its funds so that a large portion of the main stream of funding from the Department of Science and Technology (DST) was allocated to SPU. ASSAf was requested by the DHET to conduct an investigation on the possibility for South Africa to have a National Site Licensing initiative, meaning that central licences are negotiated for all universities, and for research councils and researchers. ASSAf made a presentation to Universities South Africa (USAF) whereby the risk group chairperson requested ASSAf to come up with a business case. Another presentation was made to the DST which the executive management accepted. The Minister also endorsed the business case. The letter will be sent to the new DHET Minister Naledi Pandor for endorsement because she is well aware of the work already done and its background. Background: The matter was raised in the Humanities peer review group where it was found that a large number of the Humanities journals were published by international publishers and were not listed on Web of Science. The DHET policy provides that if the seat of the publisher is outside the country then that particular journal should not be recommended for accreditation. As a result, some journals had not been recommended. A visiting scholar was appointed by CREST to undertake the study and to make recommendations to ASSAf with a view to inform the DHET’s policy development. This study was eventually put in abeyance in favour of the broader study. A task team including some members of the CSPiSA and SPU staff have drafted a ‘Second ASSAf Report on Scholarly Publishing in and from South Africa’ which spans twelve years (from previous SPP publication published in 2006) of research publishing in South Africa. The publication incorporates the commissioned study undertaken by CREST which focused on the last ten years of journals, books and conference proceedings publishing in South Africa, looking at the effect the policy has had on scientific publishing in South Africa. The draft report will be sent to the Committee and the final document will be sent to the ASSAf Council for approval, after which it will be published online in May. The report on Architecture, Built Environment and Engineering has been published and is being disseminated to all stakeholders. The two groups, Communication and Information Science, and Humanities II: Visual and Performing Arts, are coming to a close and the reports are due to be published in May and June. Currently there are three groups that are under review, namely: Education; History, Philosophy and Politics; and, Maths and Science. One report of these three groups must be published by March 2019. There are two groups remaining: Economics and Business Management (26 journals) and ‘Other Disciplines’ group (48 journals). These two groups must be set up before the end of March 2019. The print version of SAJS was discontinued in 2016 and since then the focus has changed to creating an advanced digital version of the journal. Article-level metrics were introduced on the website as well as citation export and social share buttons to give the journal an enhanced online presence. SAJS was re-indexed by the Directory of Open Access Journals (DOAJ) and also received the DOAJ seal. CrossMark was also introduced (digital tool for linking corrections to articles to help identify updates). The SAJS changed its policy to allow submission of preprints which were previously excluded. At the end of 2017 the SAJS migrated to Open Journal Systems (OJS) and a new website was created. Recently, a call was sent out for a mentoring opportunity for early career researchers to gain experience working with an Associate Editor of SAJS. There are now six journals hosted by ASSAf on OJS. The five journals hosted on OJS by ASSAf as a pilot project were upgraded to a new version which has a more user-friendly interface and article-level metrics in the form of views and downloads. ASSAf has a new relationship with the Journal of Energy in Southern Africa (JESA) which is funded by the DST. 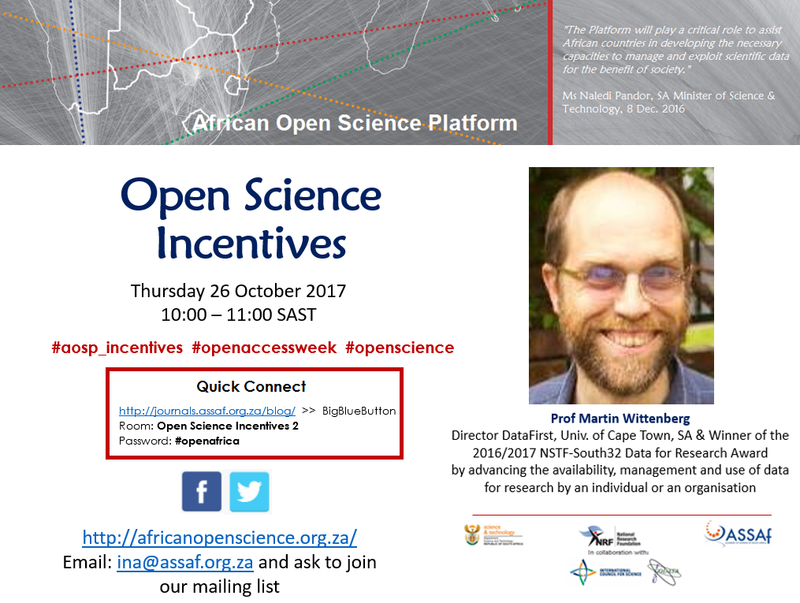 The African Open Science Programme (AOSP) is sponsored by DST and managed by ASSAf. ASSAf manages this project with direction from CODATA and ICSU (International Council for Science). 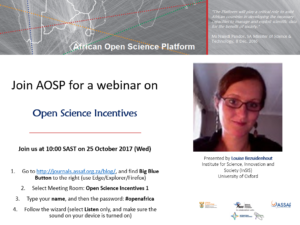 AOSP tries to understand what is happening on the African continent in terms of Open Science policy, infrastructure, skills and incentives. The focus is specifically on data and the sharing of data. AOSP is in the process of developing an expert database across the disciplines. 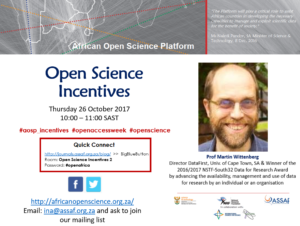 Other deliverables include frameworks and roadmaps to guide African countries on Open Science initiatives. The SciELO SA project has been running for nine years and is now automatically an accredited index. This year is the 20th anniversary of SciELO and there will be five-day event in Brazil including an international conference with the theme ‘Moving towards Open Science communication’. The SciELO SA annual meeting will be held this year. So far, more than 70 ASSAf publications have been added to the ASSAf Institutional Repository. There are fewer printed publications, everything is now available online, and usage can be monitored. The annual meeting will be hosted this year. The Code of Best Practice was revised because the previous one was published in 2008 and many things have changed in the journal publishing environment. The new Code will be a searchable electronic document with links to resources. The document was approved by the Committee and will now be sent to the ASSAf Council for approval. The document on Best Practice for Peer Review of Scholarly books was approved by the CSPiSA and ASSAf Council and was sent out to all stakeholders in the publishing sector. It was also endorsed by all the major publishers on the book publishers’ forum. Quest is a quarterly themed publication. In 2016, 13 000 copies were printed (scaled down from 25 000 copies because of budgetary challenges). The magazine is distributed to schools in all nine provinces, to public libraries, government departments and science centres. The set-up of the magazine is such that there are four cover stories, four features, three articles and three regulars. The cover stories and the features will be in line with the theme that is chosen for that term. The panel conducted research on international practices for ‘Incentivisation of collaborative research’ and conducted a study on what collaborations are taking place in South Africa and where, with whom and why. Recommendations will be discussed at the next meeting. The report will be peer reviewed, and the CSPiSA will endorse it before it can be approved by the ASSAf Council. Four Committee members who need to rotate as members: Dr Leti Kleyn who is now an ASSAf employee, Gert Kruger who is no longer a journal editor and NSEF representative, Daisy Selematsela and Nthabiseng Taole who were both NRF representatives and are no longer at the NRF. There must be nominations from the NSEF, NRF, CHE, USAf and the National Ethics Committee. The next Committee meeting will be before March 2019. After the closure of Beall’s list, there are still many ways to identify journals that publish low quality research without meeting basic publishing standards. Click on the link below to access the PowerPoint presentation of the webinar. To address problems with the peer-review process, many journals have experimented with different types of peer-review models. Open peer review was adopted by several journals in order to encourage transparency in the process, and there are now a number of different ways in which this is implemented. This webinar will provide an overview of the different peer review processes which exist, and will demonstrate how the post-publication open-peer review model is implemented on articles published in F1000Research and associated platforms. Sabina Alam is the Editorial Director of F1000 Platforms. After completing a PhD in neuroimmunology from the University of Bath, and then a postdoctoral position in neuroscience at the School of Pharmacy in London, Sabina moved from research into scientific open access publishing in 2008. After a few years as a staff editor handling the peer review process on a number of BMC series journals, she became the Chief Editor of the open-peer reviewed journal, BMC Medicine from 2011-2016. Sabina has been involved in various peer review initiatives, and is a member of COPE and the World Association of Medical Editors (WAME). Sabina joined F1000 Platforms in 2017 as Editorial Director where she oversees the editorial and publishing service for all submissions to the F1000 platforms, which all operate on a post-publication invited open-peer review model. Unfortunately we experienced technical problems and could not record the webinar.